New book, 80 pages, SS12061. 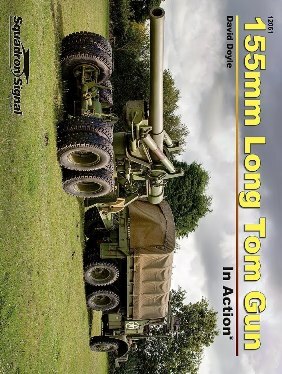 The 'Long Tom' or more properly, the '155mm gun M1A1 with M1A1 carriage and M5 limber', and the related 8-inch howitzer M1 formed the backbone of the U.S. Army's heavy field artillery during World War II and Korea. These towed artillery weapons initially used the Mack NO 7 1/2-ton 6x6 as a prime mover, which was augmented by the M4 high-speed tractor during the later stages of the Second World War. With ranges of just over 14 miles for the gun, and 10 1/2 miles for the howitzer, the duo served for many more years - with an associated change in the prime mover, to the M125 10-ton 6x6. This 80-page book documents the development and deployment of these iconic weapons, as well as their prime movers and caissons through 227 archival photos.